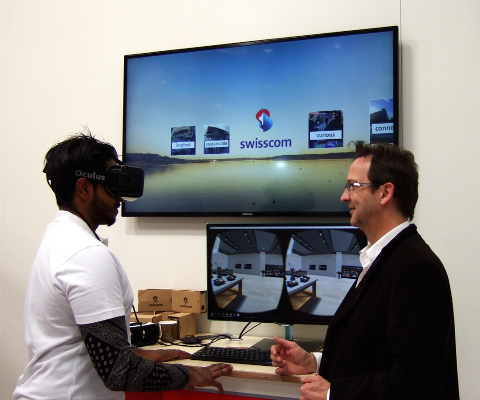 From 14 to 18 March, vComm joined Swisscom to present the virtual reality “Workplace of the Future” at CeBIT in Hannover. Swisscom demonstrated immersive workspaces that vComm has developed in their collaborative 3D environment AULA. Wearing VR headsets such as the Oculus Rift, visitors were immersed together in a shared virtual space where they could interact with each other almost as easily as in the real world. By using collaboration tools like card walls and shared whiteboards, users came away with the feeling that they had been working together as they would in a real physical office. The VR presentation drew a large number of visitors to the stand. The immersive experience was received enthusiastically and generated many creative discussions around ways to bring people closer together in a world that tends to be more and more distributed. At Swisscom, AULA has already been in use for two years, providing collaborative online sales training for their 1,200 retail staff. 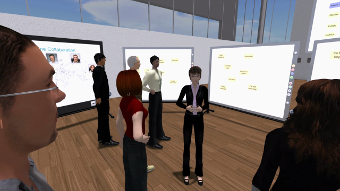 In addition to presentations and group workshops, users participate in dynamic role-play scenarios in a virtual 3D shop. AULA is currently in production in a number of large enterprises using a well established easy to use screen-based 3D approach. vComm is now extending AULA to make it ready for virtual reality. Our six years of experience in developing online 3D collaboration environments give us a deep insight from which to establish solid use cases for virtual reality that have the potential to completely change the way people collaborate and work together in the future. The CeBIT in Hannover is the world’s largest trade fair that receives more than 200,000 visitors each year. Pilot Users Wanted for Virtual Diversity Icebreaker!